Will be held at the Bjelke-Petersen Dam on Saturday November 18, 2000. All schools, clubs and businesses are encouraged to enter teams. Races will be run for all age groups. Novelty races will also be run, in these races the officials will be very flexible in their judging. Teams will be encouraged to try to sway the judges in their favour. Foreshore where races will be run. Any number of teams may use the same raft, providing of course that they compete in separate events. Team members will be charged a $5 entrance fee per person. On payment of this fee competitors will be given a book of 5 art union tickets. These tickets can be sold on so the entrant can recoup the fee or entered into the art union in the entrant's name. Another view of the foreshore. Trophies will be awarded to event winners. We hope to have perpetual trophies which will be held by the winning teams until the following year when they will be recontested. All rafts entering the competition must be constructed in accordance with the rules. Rules are available by e-mail , or by following this link rules for rafts. 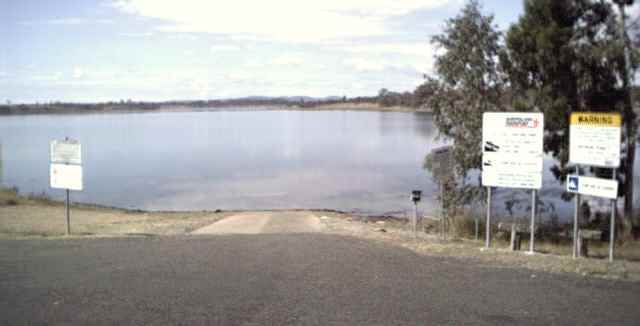 Boat ramp where rafts will be launched. Live music will be provided by Kookaburra Rock. Featuring Steve and Mikelle Harding.